14 Apr 1945: Jurisdictional control transferred from TOKYO POW CAMP 9-B to SENDAI POW Command. This was the copper mine for Kajima Corporation. Working condition were dangerous and mistreatment a daily occurance. Most slave labor was for the Fujita-gumi Construction Company. Details not yet determined. Many Americans known to have come from the Taiwan POW Camps on the Melbourne Maru. Most of these men had been sent from Manila to Taiwan on the Hokusen Maru. Almost all civilians were from Wake Island, having earlier been sent to the Woosung POW Camp near Shanghai China on the Nitta Maru. These men were then sent as slave laborers at the Tokyo 2D and 5B Kawasaki Ship Yards before movement to Hanaoka. Most of the Aussies came from Tokyo #4 at Naoetsu..
5 Americans and one Australian. External site (PDF) by the POW Research Network. One man (William Fisher) killed during food drops. James Ewing (civ.) was listed as dying at Sendai #8, but corrected to Sendai #7. 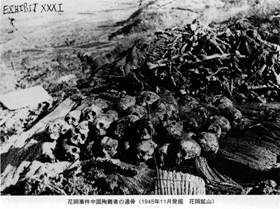 William Underwood's article documenting Japanese attempt to cover up and deny the Hanaoka massacres. An expose of the Japanese official government efforts toward revisionist history.